If you follow the Hive on Facebook, you've probably seen photos of many of my custom creations, but I don't delve into the actual creation process too much. I thought today I can focus on one of my newer custom figures and share a few details on him. I present to you, Sinestro Corps member Halös! "Kovah is a super-villain from the planet Levram in sector 6. He created a suit that draws power from a planet's magnetosphere, using it to create intense plasmic bursts that appear in the form of rings, or "halos". With his super-powered costume he took the name Halös and brought misery to his homeworld before being apprehended by the Green Lantern of sector 6, Tahr. Prior to enlistment to the Sinestro Corps, Kovah was serving life imprisonment on Levram." Halös is an original character I created to bulk up my Sinestro Corps collection. When Mattel launched the Green Lantern Classics subline of DC Universe Classics, they had a brilliant idea on how to expand the individual Corps rosters without having to create a bunch of new figures. 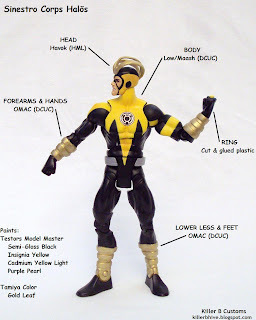 The first wave featured Sinestro Corps members Low and Maash as one figure with interchangeable heads and hands, requiring fans to only buy one figure to complete the wave's "Collect-and-Connect" figure, while also giving you the option of which SC member you wanted to display. Fans who wanted both characters on display could purchase multiple figures, too. I've really enjoyed Green Lantern ever since Geoff Johns took over the now super popular franchise. I've read and loved all the major storylines, but my favorite was the "Sinestro Corps War" and I especially loved a lot of the new villains featured there, along with a new appreciation of Sinestro himself. When the GLC figures were released I knew I would want both Low and Maash for my display, but I also saw it as a unique oppurtunity to expand and create my own characters. That's when Halös started coming together. Halös came about while I was working on my Amon Sur custom, flipping through the character guides at the end of the "Tales of the Sinestro Corps" paperback, looking for some inspiration and then checking out customs on Figure Realm. There a customizer had tackled a SC version of Amon Sur along with Ampa Nnn. I didn't much care to make an Ampa custom, but I really liked the look of OMAC's leg bracers and imagined a SC member with those plus the forearm bracers looking very sweet. So with the idea of having these thick bands on the figures forearms and lower legs the challenge was what head would make a good match, keeping the overall figure look organic, or rather, making the various pieces seem as they belonged together. I looked through my fodder bin, which thanks to a huge lot I purchased on eBay a couple of years ago, had a bunch of Havok heads from his Marvel Legends release. I figured the bands on his head would match up nicely with the bands on the body. I also decided to add some paint apps to the head to differentiate him from Havok. It took a lot of drilling to make the hole deep and wide enough to fit on the DCUC neck peg. After a lot of trial and error, I was finally able to make it fit. Swapping out the OMAC forearms and lower legs was just a matter of soaking the bodies in boiling water for about a minute, then pushing the pegs out of one side. After reheating the bodies, I placed the new pieces in and squeezed the pegs back into place with some pliers, making sure they went all the way through. I will note that because OMAC's costume is blue and red, I used a Sharpie around the joints to avoid visible paint rubs after I painted those parts in black. Another tricky part was painting the fist and feet. The golden finish on OMAC'S forearms and feet was really smooth and it made it difficult for the black paint to stick. So once again I used a Sharpie to lay down a base for the final paint. If you've ever used a permanent marker on plastic, you've probably noticed it leaves a tacky finish. This surface made it much easier to paint with the acrylic black paint. I went back and forth with what to do about giving him a power ring. At first I thought I the bands could stand-in for a ring, as if he had melded with it. However, I decided it made more sense to have an actual ring on his hand. I don't sculpt, so I just cut up a whip accessory I had in the fooder bin, glued the small disc in place and then painted it yellow. Very low-tech, but it gets the job done. I painted his eyes with a pearlescent purple color to make him look alien and further separate him from Havok. In all I'm happy with how he turned out and had fun writing up his bio. The only issue I have with him right now are the same issues I had with the base figure (Low/Maash) and that's the inconsistency by Mattel of the paint apps. Some Low/Maash figures have a less dark airbrushing than others, sometimes not even matching up across different parts of the same figure. So perhaps one day when I'm really bored, I work on Halös a bit more and give him a uniform paint job. Until then, there are still plenty of other customs to be completed!